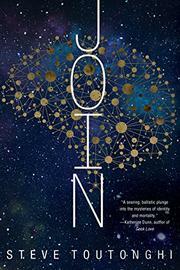 A heady sci-fi thriller about a world-altering technology—and its hidden costs. Chance just got bad news. One of his five bodies, or “drives,” has cancer. But when he's introduced to a "join" named Rope who knows a little something about losing a drive, all of Chance is soon in mortal danger. Meanwhile, there’s something weird going on with Chance's best friend, Leap, whose bodies are experiencing strange twitches that she isn’t aware of. In a world where couples or small groups can join to create a single personality that experiences life through two, or five, or more sets of eyes, those who can afford the fees can essentially live forever. Physical death becomes a temporary trauma. But Chance and Leap are about to learn that there are hidden agendas, and hidden dangers, behind this utopian facade. There’s a lot going on here, including a fascinating technology with far-reaching implications, and a lot of big philosophical questions about the nature of identity. The sociopathic Rope makes a great villain, but the plot too often veers away from the danger he presents. And because our heroes, Chance and Leap, are something more than human, they’re often something less than relatable. Debut novelist Toutonghi has attempted something very ambitious and almost succeeds in pulling it off—he’s one to watch. A promising debut that aims high and doesn’t quite get there, this one will appeal most to hard-core sci-fi fans who crave new ideas.